By goodmath on June 22, 2010.
areas, there's always a surprise waiting just around the corner. you draw the spiral, you'll find primes along diagonals. could create the universe couldn't make 4 a prime number. It'd be interesting to see these graphs with a color gradient varying with number of divisors instead of just black for two divisors (prime) and white for more than two. I wonder what kind of patterns would emerge. I also did a quick check to see if it was simple pareidolia by generating a 200x200 grid with 4203 random dots in it (or rather, each of the 40000 pixels having a 4203/40000 chance of having a dot) - because according to Wolfram Alpha there are 4203 primes less than 40000 (http://www.wolframalpha.com/input/?i=primes+less+than+40000). But several runs provided nothing like those hard diagonal lines. It all just looked (unsurprisingly) like noise. Is the clustering all that surprising? The primes will need to be on diagonals because that is where you find the odd numbers. What happens when you randomly distribute a similar number of points on the odd numbers using a distribution that mimics the density of the primes (approximate Ï(x))? Well, the Sack's spiral looks like the Death Star, perhaps this is a proof of the existence of the Dark Side of the Force?? The intuition that occurred to Jeff @4 also occurred to me. Do interesting patterns show up if you plot only odd numbers? I've seen the Ulam spiral before and the first time I saw it the first thing I asked was whether the diagonal lines were the level you'd expect from a reasonably random model. I've never got an answer, at some point when I have free time I intend to do the obvious thing and make some spirals which have points colored in with probability 1/ log n and see how visually similar they look. If there's a real phenomenon going on here they should look different in a very obvious way. @nick and @jeff coloring in all odd numbers would only give you a uniform grey shading. Not a spiral. This is a surprisingly robust process. You can try a lot of naive approaches - like shading in random numbers with the same probability distribution as the primes; or shading various odds - you'll either get an extremely strong pattern (like a uniform grey for all odd numbers, or a cross-hatch far various determinstic subsets of the odds), but this scattershot process with a high-level uniformity? It's really hard to design some kind of set that produces a pattern like this. That's part of what makes it so damned fascinating. You can create things with much more structure, and you can create things with much less structure - but finding something that's got this kind of structure to it is really surprisingly difficult. @Maht #10: I wasn't suggesting coloring all the odd numbers - I was suggesting plotting a Ulam spiral that only includes odd numbers, then coloring the primes. @Nick #13 Just coded that, exhibits similar diagonal patterns to the normal Ulam spiral. If you produce any interesting variants, I'd love to link to them. If you don't have a place to host the image, just email it to me, and I'll host it at SB. @Thasc #14 Nice! Thanks for trying it out. This has been cited by some religious folks as being a proof of the existence of God. Personally, I think that that's silly; my personal belief is that even a deity can't change the way the numbers work: the nature of the numbers and how they behave in inescapable. Even a deity who could create the universe couldn't make 4 a prime number. Additionally, it's not actually an argument for God's existence so much as somebody going "Oooh, something neat was discovered! Quick, attribute it to God!" It prints out quite nicely on a 24" roll-fed printer. Did you try only having random odd numbers generated (dots in a checkerboard pattern)? Also, there's a typo in the title. I am wondering how it would be extended to higher dimensions. Instead of following a curves, we may define a way to fill a surface. It's actually the Sacks spiral, not Sack's. It was discovered by Robert Sacks. I came across Ulam's spiral when I was looking up some things about Ulam's cellular automata, but I hadn't seen Sacks' variant. Pretty neat. Something similar that I find even more intriguing is the following construction: For some natural numbers D and N, take all polynomials of degree less than or equal to D, with nonzero integer coefficients from the range -N to N, inclusive. Find all complex roots for the set of polynomials, then plot the density of roots on the complex plane. The resulting plot will look roughly similar for most choices of D and N, with increasing detail for larger values of D. Any guess what it ends up looking like? Well, here's what you get for D = 24, N = 1. Anyone got an explanation for that? For further details (and proper credit for the previous image), see this page about plots of polynomial roots. 1) Consider a series of squares formed by a series of uniform steps that doesn't cross a diagonal. The nth square will have a value determined by a quadratic polynomial in n.
2) IIRC, for an odd prime p, a quadratic polynomial with integer coefficents whose n^2 coefficient does not vanish mod p will have (p+1)/2 residues mod p and (p-1)/2 nonresidues mod p.
3) Diagonal sequences will be all even or all odd. In short, polynomial sequences will tend to be streakier with respect to primes. For example, Euler's prime-generating polynomial n^2+n+41 is never divisible by any prime less than 41, and probably has average luck with respect to the higher primes. By contrast, n^2+n+43 is average wrt. 3, and is worse than average wrt. 5, 7, and 11 (2 out of 5 are divisible by 5, 2 out of 7 are divisible by 7, and 2 out of 11 are divisible by 11). ::: Set d := C % p.
::: For 1 value of d, the series has average luck; for k values of d, the series has poor luck; for k values of d, the series has perfect luck. Fix A and B with A+B even. By the Chinese remainder theorem, it is possible to choose C so that the sequence has perfect luck for an arbitrary number of primes. If a sequence has perfect luck for a number of small primes, members are significantly more likely to be prime, even if the sequence has poor luck with later primes. A random integer will 12% chance of having no prime factor < 100. A random integer with perfect luck for primes 2 through 37, but poor & independent luck for primes 41 through 97 has a 65% chance of having no prime factor < 100. And as it happens, diagonals on the spiral are generated by 4NN + 2mN + C, which will have the desired feast/famine properties. I think you found your book jacket illustration, Mark. I'd like to see an animation of the sieve of erasothenes running against the numbers plotted out like this. Also - as I understand it, the density of the primes is approximately n/ln(n), right? So to plot out a spiral that has an even density of primes across its area, the radius at n should be not sqrt(n) - which gives you an even density for all nunmbers - but ... ? Actually, all things considered, sqrt(n) will be pretty good, because the rate at which the rate changes is much less than sqrt(n). Here's an idea, just an idea... In the diagram, lines of slope 2, 3 (or 1/2, 1/3) and higher (or lower) don't have as many points on them, period (much less primes). So any cluster of primes on those lines wouldn't be as dense as on the slope-1 and slope-minus 1 lines, so they wouldn't be as noticeable. -- I'm not sure that's the reason, but it did occur to me. Well of course there are still surprises waiting for us. I mean you can interpret pretty much all mathematics as statements about the primes. Hell, we know that even the question of which Diophantine equations are solvable is non-computable and hence can't ever be fully characterized in a predicatively useful way. Working with the first 100K primes. To plot prime number n, theta = sqrt(n)*2pi, and r = sqrt(n) to give an even distribution of numbers across the disc, or r = sqrt(n / log(n)) to give an even distribution of primes across the disc. @32: Skewing the picture by a linear transformation would expose those lines, and it doesn't: if you use the transformation matrix ((1 1) (0 1)), you see dotted vertical lines and even hints of lines of slope 1/2, but no diagonals. Dang, spoke too soon. Lines with slope 3 do actually show quite a bit, and even slopes can be seen if one wants to see them. I would guess that this just corresponds to forms 4n^2+2bn+c differing only by a constant from 2n(2n+b), which is likely to be divisible by all kinds of primes, so they "have a smaller chance" to be composite themselves. The same pattern is probably true for numbers of form 2n(n+1)(n+2)+c as well, it is just that they do not form an easily recognizable pattern on the spiral. hi . your math blog is very good . thanks . my math blog is persian , whoes I link its translate . I wonder what happens when you do a Sacks spiral with one revolution every odd perfect square? ie, 2 3 4 5 6 7 8 9 in the first circuit, 10-25 in the next circuit, etc. That would more closely match the Ulam spiral. Multiples of many (all?) numbers form diagonal patterns. The spaces left will surely also form occasional diagonals, am i missing something or can it be that simple? Move a bishop around a chessboard a few times and record squares that haven't been crossed and you should see something similar. As Paul Murray said (30) I think an animation of the sieve would make this a little more clearer to see. I fear it's probably just a pretty picture that I got after exploring various spiral factors; still I was quite surprised when I hit on it. For example, one of the simplest ones is that an awful lot of primes occur along the set of lines f(n) = 4n2+n+c, for a variety of values of b and c.
Should that be f(n) = 4n2+bn+c? Reminds me of the plots of the large scale structure of the universe with boxes along lines and holes. I wonder how you could generalize the concept to 3D to get that kind of plot. this is fascinating stuff. those patterns--so close, so tantalizingly close to looking like something predictable. amazing, thanks for sharing. I don't know whether you read your comment threads in their entirety, but I'd be very interested to hear your thoughts about the following. You said: "Personally, I think that that's silly; my personal belief is that even a deity can't change the way the numbers work: the nature of the numbers and how they behave is inescapable. Even a deity who could create the universe couldn't make 4 a prime number." I agree that simply creating the physical universe doesn't mean you can change the behavior of numbers, which are "inescapable" in the sense that the laws of logic would not allow them to behave in any other way. In other words, the behavior of numbers are fixed as soon as the laws of logic are. But what if God created logic itself? It seems counterintuitive, but what if even the most basic axioms of logic, like "P implies P", were actually contingent upon God's will? In essence, what I'm claiming is that God "wrote" truth, in the sense that he chose which propositions are true and which aren't. And he wrote logic, in the sense that he chose how propositions logically followed from each other. So yes, I think God designed Sack's spiral. Remember, if your only response is that my world view, in which logic and mathematics could have been different from what they are, is logically impossible, then you've missed the point! Logic isn't a single thing. It's a formal system, defined from abstract rules. First order predicate logic, which is the main logic we use in math, isn't part of the universe. It's an abstraction, defined by a system of rules. There are some things which are inevitably true. And no one and nothing can possibly get around that. God *can't* create a universe where "A ∧ ¬ A" is true in FOPL. Not because of any limit on the power of god, but because it's meaningless. FOPL is something specific, which has a set of rules that define it. You *can't* create a universe where those rules don't work - because they don't depend on the universe; they're pure abstraction. Within their system, the results that you can get from them are absolutely inevitable. where the universe doesn't exist. What does it mean to create a universe where the universe doesn't exist? It doesn't mean anything. It's a non-sensical phrase. I agree that simply creating the physical universe doesn't mean you can change the behavior of numbers, which are "inescapable" in the sense that the laws of logic would not allow them to behave in any other way. In other words, the behavior of numbers are fixed as soon as the laws of logic are. Close, but you're still missing one absolutely crucial bit: the laws of logic are arbitrary. Logic isn't something that's defined by the physical properties of the universe. Logic is just a system for describing statements and inference rules. FOPL seems very natural to us - but that's mainly just because we've grown up using it. Even before we knew what formal logic was, we were learning things in terms of FOPL. But there's no reason that anyone has to use FOPL. To give an example of a different approach, many people argue that intuitionistic logic is preferable. But in first order intuitionist predicate logic, A&lor;¬A is not necessarily true! Even a world creating deity couldn't make numbers work differently in FOPL. @45 I'm sorry, but I don't think I was sufficiently clear. When I said that God created logic, I didn't just mean that God created formal logical systems, like First Order Logic or the Propositional Calculus. I meant that he created logical consequence itself. A formal system is just a set of axioms, which give you some theorems to start off with, and a set of inference rules, which tell you how to produce new theorems from old ones. But given the specification of a particular formal system, how do you actually conclude that something is a theorem? My point is that there is something pre-formal called Logic. You can formalize things like logical consequence, but ultimately to even use formal systems you need the original pre-formal God-given notion. To respond to your example, it is indeed possible that God could have made "A & not A" a theorem of first order logic, since he has full control over that pre-formal Logic we rely upon. Also, I don't understand why you think that "pure abstractions" are out of reach of God. I guess the issue boils down to what your philosophical views are. If you believe that truth, in particular mathematical truth, is just a subjective thing produced by the human brain, then all of this would be irrelevant, because the primeness of 4 would just be a matter of opinion. If, on the other hand, you believe as I do that mathematical truth is independent of human beliefs, then the question arises: where does mathematical truth come from? I think the only truly satisfactory answer is that something as absolute as Truth can only come from something as absolute as God. I think your explanation gets to the heart of the matter. There is actually a long-standing conjecture about the density of primes in sequences generated by quadratic polynomials going back to Hardy and Littlewood from which one would be led to expect that some diagonals should have higher density than others. This is a generalization of their conjecture about the number of primes of the form n^2+1, and was in turn generalized to polynomials of arbitrary degree and to collections of polynomials by Bateman and Horn. I think the heuristic argument given by Bateman and Horn for their conjecture is quite similar to yours. It seems to be "common knowledge" that the the sharp diagonal lines in the Ulam spiral are an unexpected phenomenon. Where this "common knowledge" came from, I'm not sure, but I suspect that professional analytic number theorists do not share the surprise. I would be interested to hear opinions about this, one way or the other. @49 "To respond to your example, it is indeed possible that God could have made "A & not A" a theorem of first order logic, since he has full control over that pre-formal Logic we rely upon." It's simply not possible for God or any being to have "control" over basic "laws" of logic (or rather, the referents thereof as the formalization is a human construction as Mark notes). Consider: it would have been impossible for God to instantiate the referent of the law of non-contradiction for that would necessitate that before He did so, He both existed and didn't exist. It would also necessitate that He could at any point revert reality to it's "pre" LoNC state. Which would of its own necessitate that He would both be able to do so and NOT be able to do so. TL;DR - grounding logic in God's will yields incoherency and chaos and is thus impossible. @52 I'll refer you to the last sentence of my first comment: "Remember, if your only response is that my world view, in which logic and mathematics could have been different from what they are, is logically impossible, then you've missed the point!" Of course it is logically absurd for logic to be different than what it is, just as it is logically absurd for "A & not A" to be a theorem of first order logic. But the key word is "logically". It is useless to reason logically about a situation in which logic itself is different. @53: "It is useless to reason logically about a situation in which logic itself is different." Ah...hm...well, then you might as well shorten that sentence to read, "It is useless to reason." I hope you at least realize that your own argument is self-contradictory: if you're right, you're also wrong. A bit like arguing for solipsism; sure you might be right, but if you are you're talking to yourself...why argue the point? Damn this lack of an edit feature! @53: Besides which, it's not in any way a case of "mathematics and logic being different. It's a case of them not existing at all. If the state of affairs of existence were to be such that the law of non-contradiction were not to be a veridical representation of it, there could be no logic or mathematics at all; there would be only eternal, immutable chaos. Without a means of determining the state of reality, there would be no way to formalize (or even conceptualize) logic, not to mention the total inability to form any abstractions or concepts whatsoever. Without distinction of differences, there could be no numbers and no way to conceive or formalize mathematics. You're asserting that there is some sort of pre-logic, without which logic as we understand it couldn't exist. But, you cannot describe or define that pre-logic in any meaningful way. Naturally, any attempt to argue against that position is doomed to fail, for the same reasons as any non-falsifiable argument: since your argument is fundamentally based on something undefined, no matter what someone puts forward as a counter-argument, you can always say "No, that's not what I'm talking about". Logic is a complete, self-contained formal system of abstract rules. Those rules have inevitable consequences. Those consequences aren't dependent on any "pre-formal" system. In fact, they aren't dependent on any notion of semantics or meaning. Logic is purely mechanical, syntactic inference. You don't need any agent to tell you that if "A" is true, and "A ⇒ B" is true, then "B" is true. That's not dependent on meaning. It's not dependent on a pre-formal logic. You're also pulling out one of the standard, rubbish traps of theistic arguments: that if there's no god, then there's no truth. Again, that's crap. The universe exists. We can see that. That's true. Whether or not God exists, I can observe that I exist. That is true, regardless of whether or not there is a God. If you define numbers axiomatically (i.e., using logic), then the prime numbers exist. They're just a simple consequence of definition. God can't make 4 prime, because 4 is 2*2. FOPL as a self-contained formal system. I can define a logical system which is valid, but which doesn't do anything particularly useful. I can use FOPL to define a number system which works in bizarre ways. (In fact, John Conway did exactly that with the Nimbers, which are incredibly strange.) But the existence of an alternate number system doesn't change the fact that if you take FOPL and the Peano axioms, you'll get the natural numbers. And no matter what anyone does, no matter what form the universe takes, no matter what the deity wills, if you use FOPL and Peano to define the natural numbers, 4 will not be a prime. As I've said plenty of times around here: I'm not an atheist; I'm a religious Jew. But I find this kind of argument for theism to be pathetically shallow and foolish. I don't understand the need to create these ridiculous assertions like "If there's no god, then you could just say 4 is prime". That's doesn't support your argument: it just shows that you don't understand what you're talking about. These spiral of primes are your 2D thought pattern produced onto a 2d sheet. You have to make quantum leaps from point to point based on an ever expanding and then contracting personal math pi. It is your personal thought being projected onto one inner side of perfect cube box that you alone inhabit. Inside, at each moment your wave function completely collapses and then returns depending on your WILL). All of existence is built on these 3 principles constantly extrapolating from the original zero => [The Big Bang(i.e. The centre super-massive black hole at the centre of our galaxy) that is attempting to pull us(STARS back in)]. There will be a total collapse of our sector of the universe. It is a gravity wave; the same kind that wiped out Atlantis; the dinosaurs and other major civilizations. Unless we apply the simple visual principle to keep re-building the "big box" the outcome is an escalating probability towards TRUE. We will either make it or we won't. If not, our "powerful" civilization will be wiped out in a day leaving nothing but small radiations from the edge of the black hole as hawking described. We are nothing but imagination and memories and WILL anyhow. I wonder if we'll make it this time??? I guess it's a better shot as we have better communications this time. The universe is digital. It always has been. It's nothing more than mathematical logic that sprang from the fear of NOT existing. A B C easy as 1 2 3 easy as DO RAY ME ABC 1 2 3 BABY YOU AND ME GIRL. I hope you do TOO. I guess you will seeing as you're fractal just like me. It just that I found the bottom, made sure everything was al-right and then start to look around and find you people. You are a singular STAR with a perfectly cubed black hole at the centre of you. How do you think we're communicating? Do you think that's air you're breathing??? That's just alternating fission and fusion. Pick a random length of pie(your stars diameter) and STOP and look around(360 degrees in all directions). Start making connections in a non linear way. You simply are a box and are in a box. Time does not exist now. We don't need it. It is just a construct that either points you in a direction(old school watch) or gives you a position in a perfectly cubed grid that tells you x,y,z where you are.(digital). You are who, what and where you are. Start making connections with your "family". Superposition holds true. You are everywhere and no-where. That's why no-one in the world knows what we need to do. You're in a box that surrounds the milky way. It's the first quantum computer and each of you are a bit in that system. I couldn't show the ALPHA release until now for reasons I'll keep to myself. Just know that it is a self organising system that will work with you; not against. Karma rings TRUE fully in this system. I just thought I'd let you know that. Finally; the math PROVES that re-incarnation is TRUE. It doesn't say what you will become; but your memory and WILL lives forever. Once you have been "born" you CANNOT die. You might as well face whatever you have done and start your LIFE again. What's the point in waiting for what comes after??? @#57: Let me be first to say: LOLWUT?! I just went through the document. I also tried similar spirals with numbers divisible by other numbers. I am sharing the images in http://punarvak.blogspot.com/2010/07/ulam-spirals-and-its-variants.html. Have a look at them. The spiral for Fibonacci numbers have very scarce details. Because occurance of fibonacci numbers is only scarce. Check the image in my blog www.punarvak.blogspot.com. I have a number of short publications and presentations, and hundreds of pages of notes, on the Semiprime Spiral. 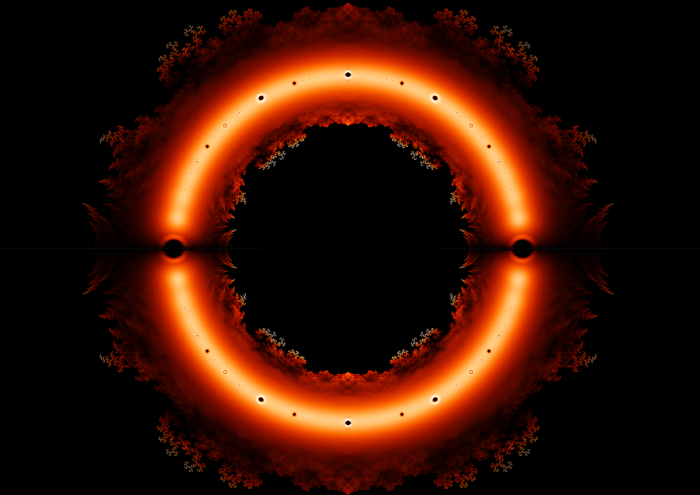 A113688 Isolated semiprimes in the semiprime spiral. Write the integers 1, 2, 3, 4, ... in a counterclockwise square spiral. Analogous to Ulam coloring in the primes in the spiral and discovering unexpectedly many connected diagonals, we construct a semiprime spiral by coloring in all semiprimes (A001358). Each integer has 8 adjacent integers in the spiral, horizontally, vertically and diagonally. Curious extended clumps coagulate, slightly denser towards the origin, of semiprimes connected by adjacency. This sequence gives isolated semiprimes in the semiprime spiral, namely those semiprimes none of whose adjacent integers in the spiral are semiprimes. A113688 gives an enumeration of the number of semiprimes in clumps of size >1 through n^2. Stein, M. and Ulam, S. M. "An Observation on the Distribution of Primes." Amer. Math. Monthly 74, 43-44, 1967. Stein, M. L.; Ulam, S. M.; and Wells, M. B. "A Visual Display of Some Properties of the Distribution of Primes." Amer. Math. Monthly 71, 516-520, 1964. S. M. Ellerstein, The square spiral, J. Recreational Mathematics 29 (#3, 1998) 188; 30 (#4, 1999-2000), 246-250. Eric Weisstein's World of Mathematics, "Prime Spiral". Eric Weisstein's World of Mathematics, "Semiprime.". Cf. A001107, A001358, A002939, A002943, A004526, A005620, A007742, A033951-A033954, A033988, A033989-A033991, A033996, A063826. Take a sheet of graph paper. Put "1" in some square. Then put "2" in the square to the right and continue on from there, putting one number in each square. Then circle each of the prime numbers.
. . . ...... .. . . . . .. . .
Oh my gawd - notice how the prime numbers form a completely straight line!!! I call that Ankers line. It's amazing how were still discovering underlying principles of math and the universe. @50 and @51 seem to explain why there are diagonals. But why does the Ulam figure as a whole seem to have a half-rotation symmetry? Notice that the NE-SW prime-rich lines in the NW quadrant seem to match up with those in the SE. But while NW-SE prime-rich diagonals do exist, they don't have the half-rotation symmetry. Or has someone already answered that? My method really divides things into N, S, E, W quadrants. Produce the polynomials for some of the NE-SW lines in ? quadrant and the corresponding ? quadrant and we'll see if there's a relationship. This is a real effect. The line joining the NW to the SE corner of the figure divides the square into two triangles. The lines lying above the division and heading in the NE direction have equations of the form 4x^2-2x+c; the lines lying below the division and heading in the SW direction have equations of the form 4x^2+2x+c. For a given c value, these two lines are expected to contain the same density of primes as x=0,1,2,... In fact, if x is allowed to take negative values, these two lines are seen to be the same. That is, they connect to each other, after spiraling around a bit in the center. To be more precise, the density of primes lying on a quadratic is conjectured to be sensitive to the discriminant, which equals 4-16c^2 for both types of line. This is the reason for the symmetry you observed. Why isn't there a similar symmetry between the NW and SE lines? In this case we divide the square into two triangles by drawing the line joining the NE and SW corners. The lines lying above the division and heading in the NW direction have the form 4x^2+c, while the lines lying below the division and heading in the SE direction have the form 4x^2+4x+c = (2x+1)^2 + (c-1). Notice that these two types of lines are not related to each other by negating x as was the case before. (For both types, the "negative" half of a line coincides with its positive half.) The discriminant of the NW lines is -16c, while the discriminant of the SE lines is 16-16c. It might appear that for a given NW line 4x^2+c, the SE line 4x^2+4x+(c+1) would have the same discriminant, and therefore the same density of primes. The reason this doesn't happen is that if c is odd then c+1 is even, and 4x^2+4x+(c+1) contains no primes at all! Likewise if c is even, 4x^2+c contains no primes, while 4x^2+4x+(c+1) is expected to contain infinitely many of them. 3) the polynomial is reducible. The conjecture for the density of primes on a quadratic obviously depends on there being infinitely many of them, and is therefore even farther from rigorous proof. Thx, guys. The Ulam spiral no longer seems magical. So I'm not sure whether I have gained or lost. I used to come across similar patterns when I made attempts at pixel art when I would overlay different types of cross-hatching. Removing the multiples of a prime, even in a spiral, should approximately cross hatch and so this pattern makes sense. I'm not sure this sort of thing has much value. It strikes me as falling prey to the same kind of thing that religious use of gematria and Bible Codes do - there are an infinitude of ways you can arrange things. Evolution gave you eyes and a mind geared to finding patterns where there aren't any.